Have you seen the STEM Kits that are available these days? 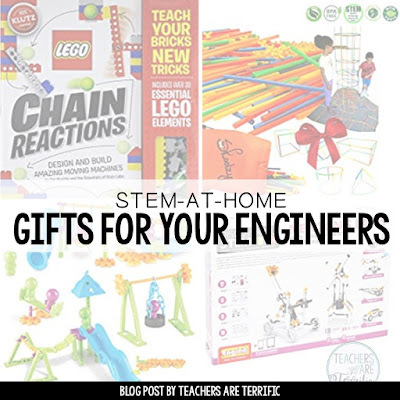 So many of these will get your young engineers started with some STEM activities and explorations-- very much like the STEM Challenges we complete in the classroom every day. The thing is- these are kits that have everything you need already in them! All the materials, instructions, and photos you will need. These would make great gifts for your engineers to keep them building and designing and thinking. I thought it might be fun to share some STEM Projects we have completed and compare them to kits you can purchase! 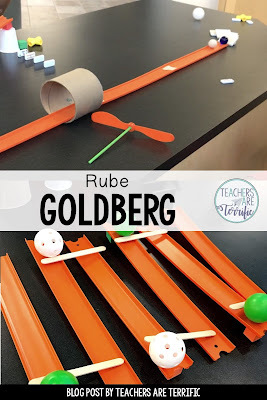 Creating a Rube Goldberg-Chain Reaction device has been on my STEM Lab to-do list for a long time. 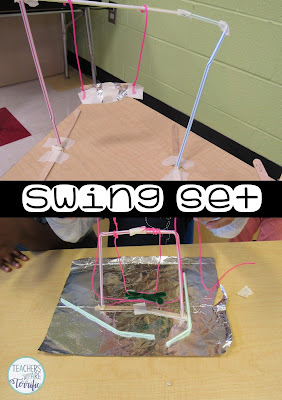 Then I found a video that showed students building these and I knew we could do it. And best, of all, I already had all the materials.The devices we built used Hot Wheels track, craft sticks, ping pong balls, and a lot of dominoes. I don't have a blog post for this event yet, but it's coming soon! I found two versions of chain reaction kits you can try at home! If your kids love LEGO they will love this kit. It comes with pieces to build ramps and devices to propel objects to create the chain reactions. Perfect for a gift for a little engineer! I also found this one which my own children LOVED when they were much smaller! My two would set this up in our foyer where we had a wooden floor. (Carpet didn't work well!) They would build and test with this set for a long time! With my first graders, we built a slide one day. We used the simplest of materials and they had such fun creating the slide portion and building a ladder to climb to the top! Look at those little pieces of straws being used for the ladder. With second graders we tried an entire playground! Check below for an at-home kit for building a playground! The Kit pictured has the pieces to complete a playground and here's the best part- the directions to it follow the Engineering Design Process! How neat is that! The kit comes with challenge cards that direct the children in building parts of the playground. Of course, they can also design on their own! My third graders build an egg car and we test it on different angles of ramps to see which will propel the car forward at the best rate of speed. This one is really fun- since it uses a real egg! Fourth graders build bottle cars and explore Newton's Law about equal and opposite reactions. The bottle car races are the most fun ever! Fifth graders actually cheered when they learned we were making Newton's Cradles.These turned out really well and certainly proved that equal and opposite reaction law! Check below for a kit you can try at home featuring Newton's Laws of Motion! The first year I had with the STEM Lab brought some luck my way! I was given a kit for teaching electric circuits. This included wires, clips, battery holders, tiny lightbulbs, and more. I invented a worksheet for kids to use showing how to wire the circuits and we had such fun. The kids followed my directions really well and we had time to create our own circuits. This was even more fun. They quickly discovered that two batteries would make their light shine more brightly....and then we learned something fairly amazing! Did you know that when you connect five batteries to a light bulb the bulb will shatter? Yep, it will! So, to prevent that mishap a kit for use at home might be in order. Just remember to use a few batteries and not all the batteries! This Snap Circuit set has all you will need and it only uses two batteries, so you will likely not explode any bulbs! There are parts and instructions for 100 projects including a siren- if you can just think about how amazing that would be! Straws are the most versatile and easy to use material. I also like them because they are so inexpensive and parents will donate them to us! Above is one of our favorites! It's the Tennis Ball Tower! It seems to be such an easy task, but it is challenging. It does not create the prettiest towers, but it does involve a lot of problem-solving and collaboration. Straws are also used in building the famous Bucket Towers. We love this one so much! Kids have to build the tower and suspend a bucket from it. The bucket is then tested for how much weight it will hold. So, of course when I found this kit that features straws I knew it would be a perfect kit. Kids love building with straws. This set by Skoolzy includes straws and connectors and ideas. It is designed for your younger engineers- kindergarten, first grade, and younger. Personally, I think older kids would love it, too. I know my third and fourth graders would really get quite competitive with this. Just look at the height of that structure in the photo!